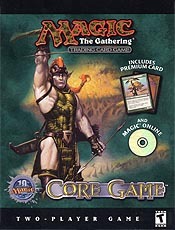 The Magic: The Gathering Online computer game was programmed by Leaping Lizard Software and released at the 24th of June in 2001. 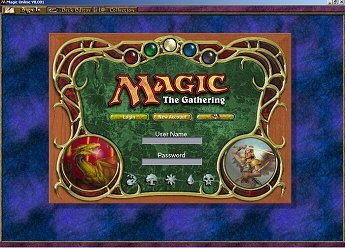 After the Magic: The Gathering computer game by Microprose and the Magic: The Gathering Interactive Encyclopedia, this has been the third attempt to create a software platform for online Magic games, for the first time including a full rule-based interface. Aside from an online duel mode for the most common single and multiplayer formats, the software features chat rooms, trading windows, an offline encyclopedia of all Magic cards, a deckbuilder section, and a tutorial. Official tournaments are held online, and the software keeps track of all player ratings. All cards from regular Magic sets starting with Invasion and 7th Edition are available about a month after their real world release and can be purchased in virtual booster and starter packs until they rotate out of the Standard tournament environment. The price structure is equal to real world cards. The software itself is free and can be downloaded. Alternatively, a software package with printed game rules has been available both as an independant product and as part of the Eighth Edition and Ninth Edition box set. 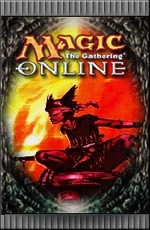 Beginning in January 2003, maintenance of the software was gradually transferred to the Wizards of the Coast development team. The migration was completed at the 16th of May in 2003, afterwards Leaping Lizard Software left the project. Version 2.0 was released on the 28th of June 2003 by the new team and introduced some new chatrooms in the game. For internal test purposes, Leaping Lizards Software created an omnipotent card named Library of Congress. This card is unavailable in the real game for obvious reasons. On 25th October 2003, a special event called Chuck's Virtual Party was held, in which a promotional booster was given out online. It contained 14 Eighth Edition basic lands and one of three pre-Invasion cards per random which had been publicly voted out of a card pool of 12 famous Magic cards. Because of a server crash that day, the booster was additionally given away to every member of Magic: The Gathering Online who logged in between the 23th of July and the 28th of September in 2003. For five consecutive months in 2005, Unhinged basic lands were introduced as special prize cards for Premiere Events. All participants reveived a nonfoil basic land, the top 8 players of each event received an additional foil basic land. The Magic: The Gathering Online game uses cardlike images with artwork to resemble tokens in the game. Once per set cycle, tokens are given new artwork in case they reappear from an old cycle. Some of these tokens exist as real world cards and are given out in the Magic Player Rewards program. Tokens created by the Mirrodin card Soul Foundry look similar to the creature card they originate from, but use a token card template of the appropriate color instead of a standard Magic card template. 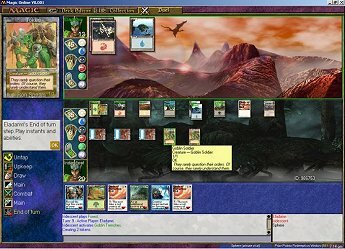 Parallel to the Magic: The Gathering Online release of Fifth Dawn in July 2004, all preexisting token cards were slightly altered visually to match the new layout of token cards. In addition, the new token cards from Darksteel were finally published. They had been delayed because of technical issues. Players have to select an avatar as a virtual representation of themselves in the online environment. While a few of them are freely accessible, the majority can only be gained for a limited period of time or just when certain requirements are met and hence can be considered a virtual collectible. Avatars can be traded. Most avatars are made available in Release Leagues. These are Sealed Deck tournaments which take place for one week. Participants can play whenever they like, but only the first five matches count towards their game record. Twice now avatars have been awarded on the anniversary day of Magic: The Gathering Online. In the first year, it had been chosen by the winner of the Wizards of the Coast Invitational, an online tournament for employees of Wizards of the Coast only, in the second year, visitors of the Magic: The Gathering website had voted for their favourite avatar in a poll. Due to technical issues with the Premier Events, the Darksteel Release League scheduled in March 2004 was canceled. The two new avatars, which had been asigned to be awarded, Arcbound Overseer and Viridian Zealot, were made available three months later in a special Welcome Back tournament. 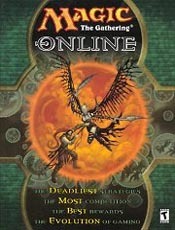 In May 2005, the concept of avatars was taken one step further by reintroducing Vanguard to Magic. For each avatar, and identically named Vanguard character card was created and distributed to all players who had the appropriate avatar in their possession. The Grog Goblin Shuffler avatar was renamed to Goblin Warchief to be in line with the other names which origin from Magic cards. In addition, Vanguard Release Events were held which granted all participants a Bird of Paradise avatar and Vanguard card and rewarded the top two winners of each event with an avatar/Vanguard card of their choice. Vanguard cards can be traded, but they are linked to their corresponding avatars and can not be traded separately from them. Starting with the Vanguard release, newly registered players receive a Vanguard booster pack containing the five basic Vanguard cards Serra Angel, Prodigal Sorcerer, Grinning Demon, Goblin Warchief, and Erhnam Djinn, 75 evenly divided non-foil Eighth Edition basic lands, and a random foil Eighth Edition basic land.